This time around make it a healthy Navratri and by healthy we don't mean boring. Healthy can be fun and exciting too and well show you how. It is that time of the year gain when Goddess Durga and her nine avataars are worshiped with great fervor and joy. While many devotes fast on the first and the last day of the nine-day long festivals, others choose to go vegetarian and also tend to avoid items like onion and garlic in their regular meals. Whether you choose to fast for all nine days or just on a couple of days, it is important to do it the healthy way. Fasting can be a great way to cleanse your system and detox it, if done correctly, it can promote health. This Navratri, keep some of the most basic points in mind and fast the healthy way. The festival of Navratri 2017 is here and many devotees of Goddess Durga indulge in a period of fasting for nine days as way to show their devotion to the Goddess of Power and Strength. Fasting is also a great way to detox and reboot your system by allowing your body to take a break and cleanse itself from within. During the Navratri fasts, you are prohibited from consuming certain foods like wheat, alcohol, processed rice, salt and non-vegetarian food items that are hard to digest and instead you turn to lighter foods like fresh fruits, seasonal vegetables, sabudana or the samak ke chaawal. These foods are saatvik in nature and tend to rejuvenate you from within. However, we may get carried with deep fried and oily preparations such as Kuttu Puris, Sabudana Vada and Kaddu Pakoras which can end up adding unnecessary calories your diet and extra inches to your waist. So, this time around make it a healthy Navratri and by healthy we don’t mean boring. Healthy can be fun and exciting too and we’ll show you how. Fasting doesn't mean that you have to starve yourself. It is good to have small and frequent vrat meals through the day to keep your blood sugar controlled and your metabolism up. Small bites and snacks in between meals like a fruit chaat, baked sharkandi fries with sendha namak and black pepper, a bowl of fresh water chestnuts with coriander chutney and raw banana kebabs are great options to avoid to the slump and keep your energy levels high. Fasting or not fasting, it is very important to follow a balanced diet and make sure you get all the essential nutrients your body runs on. We know that your options are limited, but there are a lot of healthier options that you still haven’t experimented with. You don’t need make aloo or sabudana a permanent fixture on the menu. Try more wholesome and nutritious dishes like Chironji ki Dal, Arbi Kadhi, Makhane ki Sabzi or Jhatpat Palak. It is important to stay hydrated while fasting, but avoid drinking too much tea or coffee as it may only leave you dehydrated and increase thirst. Some healthier Navratri beverages could be fresh coconut water, fresh fruit juices, buttermilk or a glass of shikanji. These will also add more variety to your menu. Protein is an essential component of your daily diet and you shouldn’t compromise on it. It keeps you full for longer and prevents binge-eating and unnecessary cravings. During Navratri fasts, you are restricted from eating grains or lentils, but you can derive good quality protein from other sources too. Amaranth is a great source of protein. You can make a savoury daliya with it and other vegetables or you can also use it to make amaranth tikkis. Cottage cheese or paneer is another great option. You can make a Paneer Tikki or try this Paneer Mazedaar – a rich curry with paneer, melon seeds and singhara ka atta, if you are in the mood for something more festive. While you’re off processed salt and use pure rock salt instead, it is good to take a break from refined sugar too. Although you are allowed to consume it while fasting, it’s great to give your body a break from chemically processed food items like refined sugar. You can switch to jaggery or honey to satisfy your sweet cravings. “Keep nuts handy; dry fruits and nuts give you a nutritive, energy boost. Load up on fresh fruits and vegetables to get a smooth and steady supply of vitamins and minerals that’ll help you keep energized throughout the day,” shared Dr. Rupali Datta, Consultant Nutritionist, Fortis Escorts, New Delhi. Stick to these basic diet tips and you’ll be able to enjoy your fasting days and at the same time keep yourself fit and healthy. 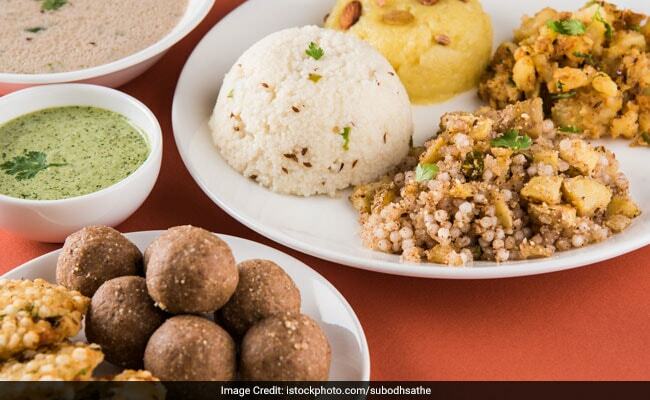 Navratri 2018: Which Fasting Foods Are Healthy And Unhealthy For You?